I'm the first one to say I'm not going to do Pinterest much because I don't want to get addicted, but when I needed ideas for coloring Easter Eggs...where did I go first? You guessed it. It was fun, and I was delighted with some of the designs I found. Sharing them would be fun, but I'm guessing some people don't like their photos shared, even if you cite the source. So if you want to see my top three faves, I'll give the links. My favorite was this Faux Gilded egg from Just Paint It. I thought it had a great travel or map feel to it that I really liked! My second favorite was the Glow in the Dark Easter Egg I found from Growing a Jeweled Rose. It is not a wild guess that the kids would love these, especially at nighttime. And last but not least, I really liked these simple Twine Tied Eggs from Smart School House! They look very easy to do and the twine adds just the right touch of festive to the project, without requiring a lot of time. Of course there were a million other eggs I liked. Star Wars characters, smiley faces, speckled robin's eggs, and so on and so forth. In the end, because we'd been gone all weekend and didn't have a lot of time, we opted to just dye them with Vinegar and a color tablet (laugh if you want to, I did...all those elaborate plans and we did none of them, lol). The dye tablets were simple, effective, and we thought it was fun. But next year... maybe we'll be ready to move on to something more elaborate. Are you doing eggs this year? If so, are they done yet? Do you get fancy, or keep it simple? Your eggs look perfect for Easter. I particularly like the one tha says Dad. They came out great. Love them! We haven't done eggs in awhile but I use blown out eggs so I have almost all of the ones we've made over the years. I think the blown out eggs are such a fun idea. It's neat that you've saved yours! I am so sad, Mariah will be in Washington with her dad this Easter, so it's just me and my little Allison. We will be coloring eggs though. I haven't decided how we want to do them yet. Those are pretty! My son is only 2 years old. So, it will be plastic eggs for the time being with this busy mom :). Thank you so-o much for stopping by my Blog. I am now your new fan! Thanks for stopping by my blog! I've kind if started my egg decorating. Nothing really fancy. I thought it would be a great time to use my food coloring pins I got a long time ago. I did chevron patterns on mine. I'm thinking of putting pet treats in mine and giving them to some of my family and friends pets also. :) Can't wait to see more of your blog. Now following via bloglovin'. Have a wonderful day! I went back and am following you on BlogLovin' too. It's taking me a little bit to get used to doing that (Bloglovin' being semi-new to me in terms of actually using it :) ). Thanks for the visit. My younger sister Terra always buys all the stuff. When I do color them I get fancy. I loved your quilt that you posted about today! There are so many great egg ideas out there. Pinterest is chock full of them right now! Last year my family and I tried natural dyes with onion skins and different spices, and it didn't work out as well as we'd hoped and it was really messy! We all agreed never to try it again haha. It's too overwhelming Rosie - do I mod podge them? do I dye them? do I paint them? Your eggs are great. I love your honesty about wanting to do something elaborate/different and then sticking with the old standby. That's what we did. They even had spiderman stickers to put on the eggs, but didn't. They just wanted to keep it simple too I guess. The glow in the dark eggs sound fun. We did some Easter egg coloring last weekend ... While it was fun for all of ten minutes for Reagan I'm sure she will enjoy it a little more when she's older. This would be so much fun! I haven't dyed eggs in FOREVER! Haven't done them in a long time and sometimes easiest is best, nice job. 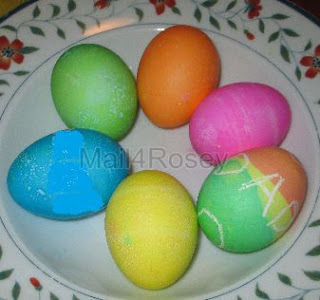 I've always had fun with Easter Eggs...might do some this weekend since you've inspired me! I love dying Easter eggs! This is my first year that I get to do it with my granddaughter so I am very excited! Your eggs look just beautiful - and so much better than my "crafty" efforts! Hahaha, now that you mentioned it, MINE probably look better than my crafty efforts would have looked. ;) LOL! I don't color eggs but I sure love to boil then and eat them! I hope you have a wonderful holiday weekend! Sweet hugs! And I'm leery of Pinterest for the same reasons you mention. :) Have a great Easter weekend. Since I have to make so many (yes 2 dozen to me is too many) I might just keep them simple...but I'm not sure...probably will come up with something "last minute funky" lol...Happy Easter my friend! Even your simple will be gorgeous, I bet. I've seen your work. :) Happy Easter to you too! That made me remember chocolate eggs from yesteryear that I'd totally forgotten about. They had pretty yellow piping and tasted so gooood! this will be the first yr in many we are not...too much stuff going on!! next yr we will do double!! not laughing one bit - the eggs look great - love the bright colors!! :) steve and i dyed eggs over the weekend with paas tablets and food dye and had so much fun!! wishing you a wonderful weekend and a happy early easter!! Happy weekend and early Easter to you too! I do the same thing---stalk Pinterest and then do my tried and true thing. Thanks so much for stopping by my blog yesterday via Thursday Favorite Things. I'm following you. Have a wonderful Easter. I like keeping it simple, so the vinegar and dye tablets are just fine for me too;) Everyone is too old now for egg coloring. I miss it! Aww, if you lived closer we'd gladly incorporate you into our holiday pre-activities (aka: we'd put you to work ;) ). What a fun idea party idea for the kiddos!